For this tag, I had set a lofty goal for myself on this place. I decided I wasn't going to shoot any buck unless it was at least 4 years old, regardless of the size of the rack. For some people, shooting only older bucks is an everyday practice. I haven't always been so disciplined, and although I believed in management it usually had exceptions. I am a native Mississippi boy. So, as you can imagine, there are a lot of exceptions! This year though, I made my mind up, NO EXCEPTIONS. To complicate matters, I made up my mind I wasn't going to shoot unless I could film the hunt as well. On the third day of season, I was tested! A great buck with a score better than most on my trophy wall walked out onto a food plot. I looked this buck over thoroughly and struggled with deciding his age. After all considerations, I decided he was only a 3-year-old, and for the first time, I let a great buck walk by. While he fed through I filmed him. Later, I reviewed the tape to confirm he was only a 3-year-old, but wow, what a great deer! I was out every morning before dark until the dark of the evening. I did finally get to see a mature deer, but he was broken up and I elected to pass. Days of November then started to tick by. I kept telling myself a giant was going to come out any minute. Each morning I climbed into one of my Lone Wolf stands for another tough 11 hours. During those long sits it was hard not to think about the deer I had passed up the month earlier. My hunts had their exciting times when I would see a buck worth shooting. But when their attention was on a hot doe I stood no chance. Some shooting opportunities were lost when trying to film myself make the shot. Nothing was coming together as I had planned. I got pretty desperate after a few weeks and decided to buy a decoy that looked more lifelike. I had great encounters with my new decoy days on end but just never with the right bucks. After my third week in November, I was really burned out, to be honest. The rut slowed down and the numbers of deer I was seeing got less and less. I said, "You know what? I think I will," and I closed my eyes. After about five seconds, I realized that my decoy was not supposed to get wet and I jumped out of bed. I told my wife I needed to go and get my decoy. I had laid it down next to my tree and covered it with my jacket the night before. I threw on my clothes and raced out the door. I parked my truck and grabbed my camo raingear from my clothes container. As I was about to walk away, I thought I better take my bow just in case something weird happened, so I threw on my backpack that I have my bow in and started towards my stand a quarter-mile away. The closer I got to the field my decoy was in, the harder the rain poured. By the time I reached the decoy it was pouring cats and dogs. I determined it would be better if I waited until the rain let up before trying to carry it out. It appeared that the jacket I had covered it with was doing fine at keeping it dry. I climbed up in the treestand to wait out the rain. In desperation, I blew a grunt at him. He stopped and both ears pointed back towards me. I knew he heard me, but he never looked my way. I didn't want to grunt again because he had already confirmed he heard me. He just kept walking away following the does as they headed west. I was convinced he just wasn't interested and I thought, Well, at least I should film him walking away. As the buck was about to exit at the far end of the field, he stopped and stood there a second. Then all of his hair stood straight up and he turned and looked right in my general area. He pinned his ears back and started stomping my direction. It was as if he needed a minute to think about whether he wanted to fight or not. It was obvious he decided he wanted a fight! I got my bow ready and did my best to follow him with the camera. I knew he would try to circle downwind of me. So, I put the camera in the opening I knew he was about to walk though and I drew my bow. He took one posturing step after another and I settled my pin and started squeezing. My Shuttle T Lock broadhead found his heart. Seconds later he tipped over within sight of my stand. I let out the loudest "Woooohhhhhhhhhh!" I had ever done in the woods. I called my wife and excitedly told her what happened. I told her to get our boy up and head my way. I wanted them to be there when I went over to look at my reward. As I waited, I watched the footage over and over again. I just could not believe what had happened. Like I said, in November anything can happen, and all you need is just a second of everything going your way. Once my wife and boy arrived, we went over to see my buck. He was an absolute brute of a deer. He had the biggest body and neck I had ever seen and it actually made his horns appear smaller than they were. We properly tagged my buck before moving him and brought him out to show the neighbors. I don't think I am alone when I say there is just nothing in the outdoors better than hunting whitetails during November in the Midwest. They are those magical weeks where you don't really need to be picky about a certain tree or need a huge food plot. All you need is to be in a tree anywhere that there are a few does. Everything that can possibly happen after that is just left to chance. The one time where you don't go out may have been the day your dream buck walked by your stand. It is the one time of year when you actually have a chance to see the ghost of the outdoors. Over the years, I have hunted nearly all the Midwestern states, and each one has all the ingredients for giant bucks; good cover, good soil, vast amounts of grain and, most importantly, good genetics. Out of all the states I have hunted, Iowa has always been the one that stands alone as my favorite bowhunting state. I have always coveted an Iowa tag, ever since my first hunt there over a decade ago. In addition to big bucks, Iowa's public-hunting grounds are as well prepped as most private lands in neighboring states. Iowa is one of the few states that adds food sources and food plots to state lands. It is tailored for bowhunters, because there is no rifle hunting for bucks allowed and the number of tags for non-residents is somewhat limited. So, with all that factored in, the bucks that reside in this great state possess all the ingredients to reach maturity. Younger bucks with near Pope and Young scores are much more common during a sit than in any other state I have hunted. I have been fortunate to have had great luck while hunting private lands, public lands and with a reputable outfitter. I want to remind you that right now is the time to apply! You only have the month of May to apply for a non-resident deer tag. Even if you already have your time accounted for this hunting season, I would urge you to still apply for a preference point. If you are a non-resident, it will take a few years to draw a deer tag, but that gives you more time to plan. There isn't much more time. You can apply online at //www.iowadnr.gov/wildlife/files/deerappl.html you can also call and apply over the phone at 800-367-1188. If you don't know where to start for hunting this state, I can strongly recommend looking up //www.tailsofthehunt.com . 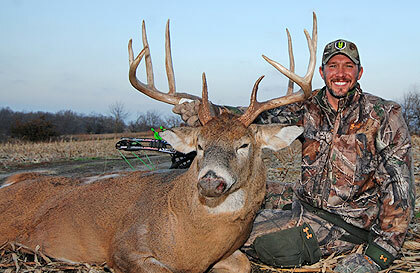 Aaron is a great guy specializing in out-of-state hunters focusing on giant whitetails. This is the outfitter I prefer to use. I wish you the best of luck in the draw and hope that you have a great season to go along with it!